Class Motto: "Let the dreams we eagerly imagine give use the light in which to see our paths and the foresight to choose the correct one"
Rebecca Calabia Scotty Giles Catherine Mitchell Steve Truesdell Jr. Alumni in red italics are registered. Do you know the whereabouts of our classmates? If so, tell them about WHOA! Are you a Class of '89 WHS Alumni? Already registered, but want to change your information? Click here to go the WHOA directory. 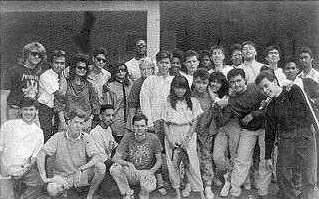 What was unique at Wagner for the Class of '89? Being born and raised at Clark AFB, I felt a great loss when they closed the base down because of Mt. Pinatubo. My greatest memories were at Wagner Middle and Wagner High where I met my very closest friends, including my future husband, Jerry Lewis. Both my parents were educators. My father was a guidance counselor at Grissom earlier in his career and at Wagner Middle until they were evacuated. My mother was an ESL teacher at Wagner Middle. My brother, Alan (Class of 86) and I were the few "teachers" kids who were born there and stayed until our graduation. So, we saw a lot of people come, go...and even come back. The people that I keep in touch with all feel that we're all part of a family and constantly reminisce about the good ol' Wagner days. There's a special bond which hold us together - probably a result of being in a "little America" in a foreign country (on a tropical island even). I remember all the road trips we took for volleyball, softball, and basketball..riding on the bus to Manila, Subic, or Baguio. Then, there were the great Far East trips. In the late 80's a new teen center was built, Images, which became a kind of a hangout. Then, of course, there was Fields Avenue where everybody went out (mostly illegally). So many things changed around the base....the Bamboo Bowl became "Challenger Field." A new high school was built (practically across the street from my house), which seemed so foreign to me when I went back for Christmas. The base was still beautiful and well maintained.It was such a shame that it was going to be closed. When I went back for Christmas after the volcano erupted, it was so sad and depressing to see all the damage. The base looked like a ghost town, as well as the surrounding communities. The Philippine Air Force had moved into some of the housing and had their squadrons in some of the buildings. The only thing that seemed to be taken care of was the golf course. There were still guards everywhere and the only reason why we were probably allowed on base was because we are Filipinos (we didn't tell them that we were American citizens). This page was designed and is maintained by Patrice Palomares Lewis '89<patrice.lewis@usa.net. If you would like to contribute photos or other Class related material, please contact me directly.